Because modern science is so bent on controlling the power of life and death, it comes as no surprise that tadpoles started growing eyes in odd places recently. What transpired at Tuft’s University School of Arts and medicine is almost Frankensteinish if it weren’t done on such a small scale. By small scale is meant the up-sized pic of a tadpole seen below. That red arrow? it’s pointing at a mis-grown eye…on its tail. Yup, thanks to bioelectric currents at the cellular level. The process of growing body parts and internal organs through very subtle means (out of nothing even) is known as Organogenesis, a creepy term for experiments whose fruits may lead to mutant sci-fi alterations in the coming dystopian future awaiting us. But wait, because other than the frightening specter of mutated living things, the reserach that created this freak tadpole is quite compelling. The scientists involved have more or less succeeded in proving their hypothesis, whcih states that certain bioelectric currents, if manipulated, can program cells to function in certain ways. So there, ta-da! 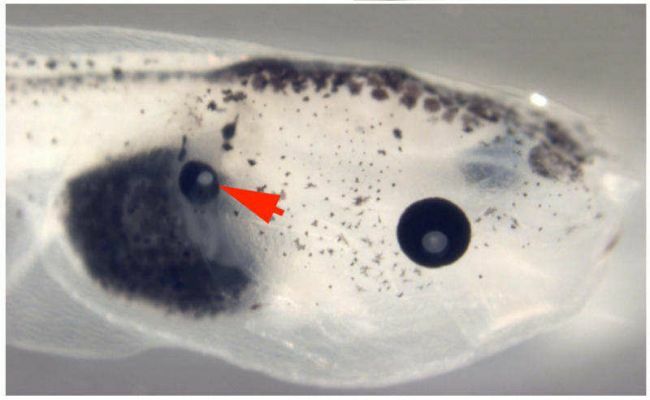 A tadpole eyeball where its tail is.